Presentation Barometer. Mounted on mahogany finish plinth. Can be supplied with brass engraving plate. 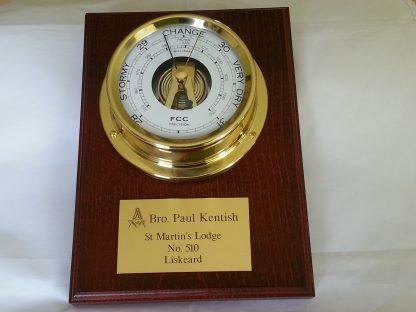 Spun brass barometer with open dial. Perfect special gift for retirement/wedding/anniversary. For home use. Presentation Barometer. 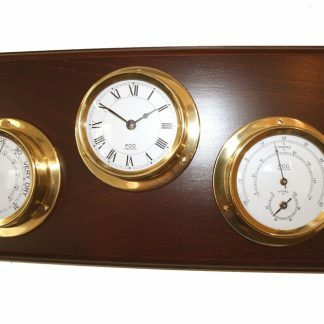 Spun brass Barometer with open dial, allowing attractive movement to be seen. Atmospheric pressure shown in inches and millibars. Presentation Barometer is mounted on solid mahogany plinth. Brass engraving plate can be supplied, if required. 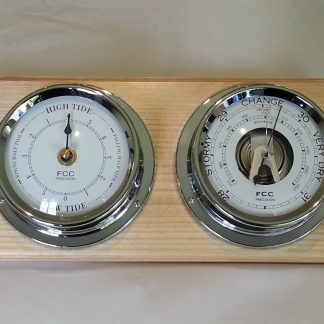 Barometers read the pressure of the immediate location where placed. It will advise you of what weather to expect in the next 12 – 24 hours. No further need for regional weather forecasts! How to ready your barometer: The gold pointer in the glass should be turned so that it rests directly above the black barometer pointer. The gold pointer acts as a marker enabling you to remember today’s pressure when you next look at your barometer. You can thus see whether the pressure is rising or falling and how significant a rise or fall in pressure has occurred. A rapid increase in pressure indicates a short period of good weather and a fast decrease indicates storms and strong winds approaching. 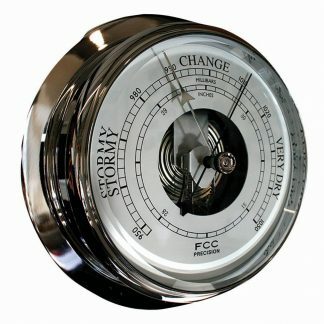 A slow, constant increase in pressure indicates a period of settled, dry, sunny weather, whereas a steady decrease indicates persistent bad weather. If the pressure falls considerably below 1000 millibars, you can expect storms and strong winds.